I had the pleasure of hearing singer/songwriter René Marie at the Monterey Jazz Festival last summer. She gave an outstanding performance so I knew we would be in for a treat this evening as she performed songs from her new MAXJAZZ album Live At Jazz Standard. René as wonderful stage presence and is very in touch with her audience. She opened her set with “Deed I Do” which featured a scatting call and response with her drummer T. Howard Curtis III. We rolled along with her as she captivated us with the sultry and sensual reading of “Surrey with the Fringe on Top.” She teased that “all the gray haired and no hairs” should know her next song which was a bluesy, soulful cover of The Beatles’ “Hard Day’s Night” which also featured the walking bass of Elias Bailey. René is a great storyteller and she gave us little nuggets of wisdom before each song. The room fell silent as she told how she was first introduced to the music of Nina Simone when she was 15. She found great strength in her music but originally thought “I Loves You, Porgy” was too weak, too needy. Accompanied by John Toomey on solo piano, she gave a powerful yet poignant rendition of this classic love song. Her up-tempo, jazzy composition “I Like You” was inspired by her brother. The beautiful ballad “Shelter In Your Arms” was about letting her guard down and being loved. Her voice blends so well with her trio of wonderful musicians. René closed with a unique intertwining of Maurice Ravel’s “Bolero” and Leonard Cohen’s “Suzanne” which has become a signature song of her performances. She introduced this song by telling us the influence her father had on her music. René was the fifth of seven children, growing up in Roanoke, Va. For entertainment, her father would play “Bolero” and pretend to be an African hunter with a broom as his spear. He also enjoyed “Suzanne” so her interpretation of the two songs is a loving tribute to her father. She scats the opening notes of “Bolero“, then the drums march in and she sang “Suzanne.” The audience was in amazement as René turned the impossible into the sublime. René will be returning to the Bay Area for the San Francisco Jazz Festival on 11/2. 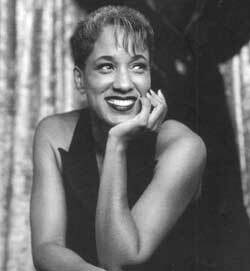 Read more about this gifted performer on her MAXJAZZ website or her personal site, renémarie.com. This entry was posted on Wednesday, May 28th, 2003 at 7:52 am. It is filed under Concert Reviews and tagged with jazz, MAXJAZZ, René Marie, vocals. You can follow any responses to this entry through the RSS 2.0 feed. You’re just daring me to make that San Francisco trip, aren’t you? I had the pleasure of meeting Rene at the Jazzschool in Berkeley. She’s a trip! Really really down to Earth and clear about what she wants. And her voice is just stunning — I look forward to seeing her star rise!